The two small tombs, unearthed in the southern city of Luxor contain mummies, funerary masks and coffins which date back 3,500 years. The ancient vaults add to a series of archaeological discoveries Egyptian authorities hope could revive the country’s stagnant tourism industry. The tombs, dated to 1550-1292 B.C., belong to officials who likely served in ancient capital of Thebes, now a UNESCO world heritage site. — David Mac Dougall (@davidmacdougall) 9 декабря 2017 г. ​Archeologists found a mummy wrapped in linen in one of the larger of the two tombs. An inscription on the ceiling bears the name of King Thutmose I of the early 18th dynasty. One tomb has five entrances leading to a hall, while the other has a six-meter burial shaft leading to four side chambers. 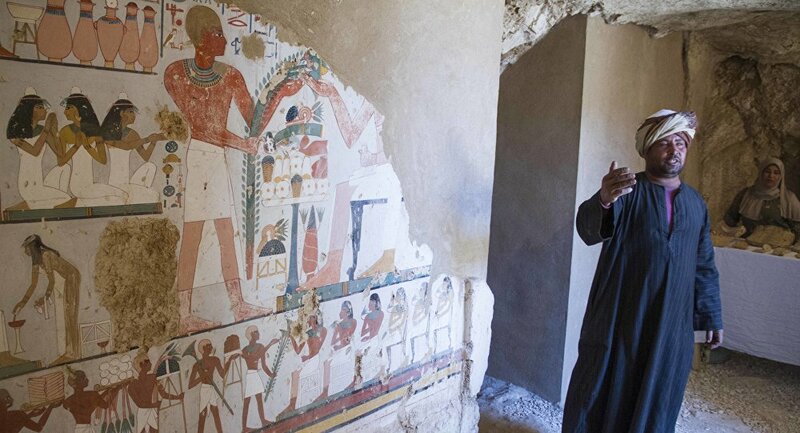 “It is a very important discovery because both tombs contain very rich funerary collections, and one of them has a very distinguished painted statue of a lady in the Osirian shape,” Egypt’s Antiquities Minister Khaled al-Anani said on Saturday. Archaeologists also found a number of funerary cones, painted wooden funerary masks, clay vessels and a collection of some 450 statues in the tombs, located on the west bank of the river Nile in a cemetery for noblemen and top officials.